I took this shot while out on a Orca whale watching during my vacation on Vancouver Island last summer. It was the only pretty day I got on the trip. We were lucky to watch a playful transient pool of Orcas that day. After watching the juvenile porpoise in and out of the water for a while, we headed off to towards Race Rock. The clouds were starting roll back in when we got there, nearly swallowing the Washington mountains in the distance. This entry was posted on Sunday, April 1st, 2012 at 8:01 PM. 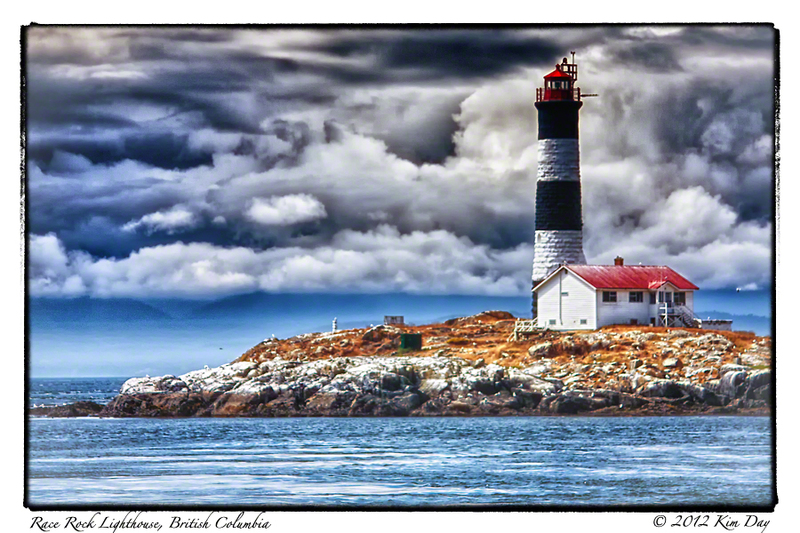 It is filed under Canada, Globetrotting: Near and Far, Photo Of The Week, Victoria and tagged with British Columbia, Canada, Color Efex Pro, HDR Efex Pro, HDR Photography, Lighthouses, Race Rock Lighthouse, Vancouver Island, Victoria. You can follow any responses to this entry through the RSS 2.0 feed. My great grandmother Grace Argyle was born on Race Rocks in the 1870’s. Her parents, Thomas and Ellen Argyle ran the lighthouse there from 1867 to 1888. I would love a copy of your photograph. It is by far the best image of Race Rocks that I have seen since starting my research into this branch of my family. It is a stunning photograph, well done!